For those who read my post on crochet/yarn hacks, you know I wanted to make a crochet caddy. The sad truth is that there are many, many things that I want to make that get forgotten or, due to lack of hours in a day, never get made. But this is a post about what did get made so, YAY! I guess I really was pumped up about that post because, not one, but two crochet hook caddies was born and are already in use. There was the added desire to have something pretty to store my new Clover Armour crochet hooks I got for my birthday. At this stage (below), this one was in two pieces, the outer bottom and the snug upper layer. There was no top and it looked pretty nice but I wanted to give the hooks more separation. I love crochet challenges. Crochet challenges have been lobbed at me from family, friends, the kids at work and me. A recent challenge came from my hubby. He is a graphic designer and has many samples of products he’s worked on laying around. One of his current projects included a cute toy called Eli the Firefly. His client is a dentist who created a book and a plush lighted toy that inspires kids to brush their teeth properly. Hubby asked if I thought I could recreate the toy in crochet. As if there was any doubt, of course I could! What kind of question was that? And if so, would I? He thought it would make a nice gift for his client. It was a fabulous idea and I accepted the challenge. I have two more dolls I want to make at work before the end of the school year. I’m hoping they’re my last two student requests. I guess I should say I’m planning to stop at these two dolls because the request never stop coming. But I might get suckered, I mean convinced, to do more. 🙂 One is a Mario rag doll from Super Mario Brothers. I’ve been putting off doing this one because it seemed more complicated. Not the doll itself but getting the face and the hat just right so that it looks like him. The other request was for a Spiderman doll and I almost started on that one because it’s not that hard to make it LOOK like Spiderman even if it’s not perfect. But I put Mario off too many times and I finally went for it. I looked at different sources to find a look I wanted to work with. I actually combined different looks from different sources. I used Minecraft versions, Lego versions, and the actual image from the game. The trick is to go as simple as possible, at least with these dolls because the idea is to get them done quickly while still clearly recognizing what they are supposed to be. If the child doesn’t think it looks like the character, then they are disappointed. So far, I’ve been pretty successful with student happiness but this one had me worried for some reason. I thought a lip on the cap would make it more recognizable. The emblem had me worried but the kids knew what it was right away. Phew! Not sure this looks like Mario but the kids seem to think so. The hands didn’t turn out exactly right but I think it was close enough for this round. I keep all the little scraps of yarn we collect at work so I used those to make the different colors on his hands. Since they would be hidden, I made individual cross stitches and tied them up with a double knot inside. My student (and his dad 🙂 loved him so I was quite pleased with the result. That character is a bit more complicated so I’m spending some time contemplating how best to approach that project (while my student is in the background asking me if I’m done already!). In the meantime, I’m finishing up a rag doll style mermaid. The head is made up of two abandoned square pieces made by a co-worker. I hate wasting anything so I took this time to work on something other than Minecraft and turned the head into a wannabe Ariel from the little mermaid. I’m working the body in the round instead of my rag doll motif of rectangles and squares. Should be interesting: square head and round body. Hey, it’s my doll and I can do whatever I want. 🙂 I will post pictures when I am done, even if it looks wonky. So, I wanted to finally make the second doll dress my sister wanted for her baby doll. When she asked for it, I told her sure, sure, no problem. 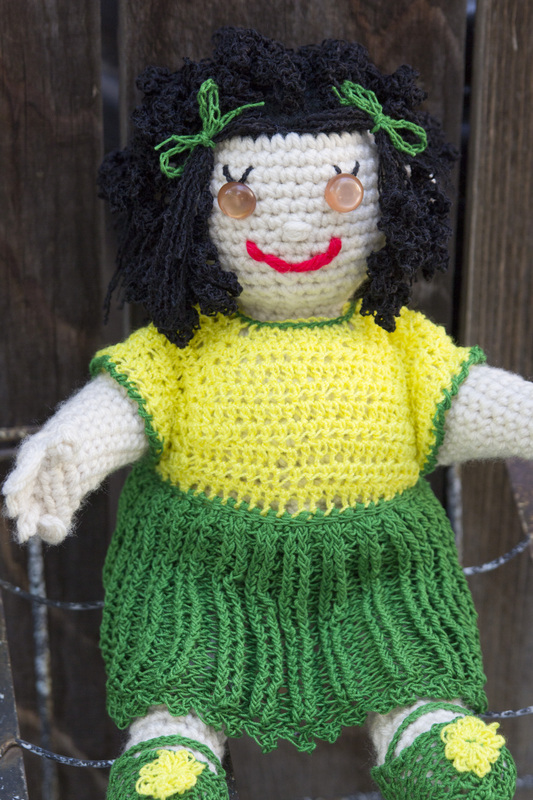 What I didn’t tell her was that I had permanently crocheted the other doll dress onto the doll. I do that sometimes when I know that someone isn’t going to take the dress off of the doll. In retrospect, I should not have done this with this doll. So instead of telling her that in order to make her doll a new outfit, I might have to destroy the old outfit to get it off, I just agreed to make a new one and in secret, hoped I could figure out a way to get the old outfit off without ripping it to shreds. I realized this was a bad plan from the get-go but there was a chance, a possibility, that I could gently undo something that would allow me to take the old dress off and then redo it so it could be removable. If that were the case then I didn’t have to tell her anything :-). So one day, when I went to pick up my son who had spent the night at her place, I arrived early while she was at work. I snuck into her room (the door was open so it wasn’t like I was breaking in) and grabbed the doll and inspected her carefully. I was in luck! The top opening of the dress had been large so I had crocheted a slip stitch all around it to tighten it up and then wove in the ends. It was in a contrasting color so it was very easy to pull out the slip stitching. I was able to easily remove the slip stitch row around the neckline. I was then able to pull off the dress with ease. By the time my sister got home, she found me happily working on her doll’s new dress and I didn’t have to admit to anything :-). I just told her I had to undo the slip stitch and that I would fix it later. I got pretty far on the outfit by the time I had to leave but I was coming to realize very quickly that I was going to run out of the green yarn I was using. 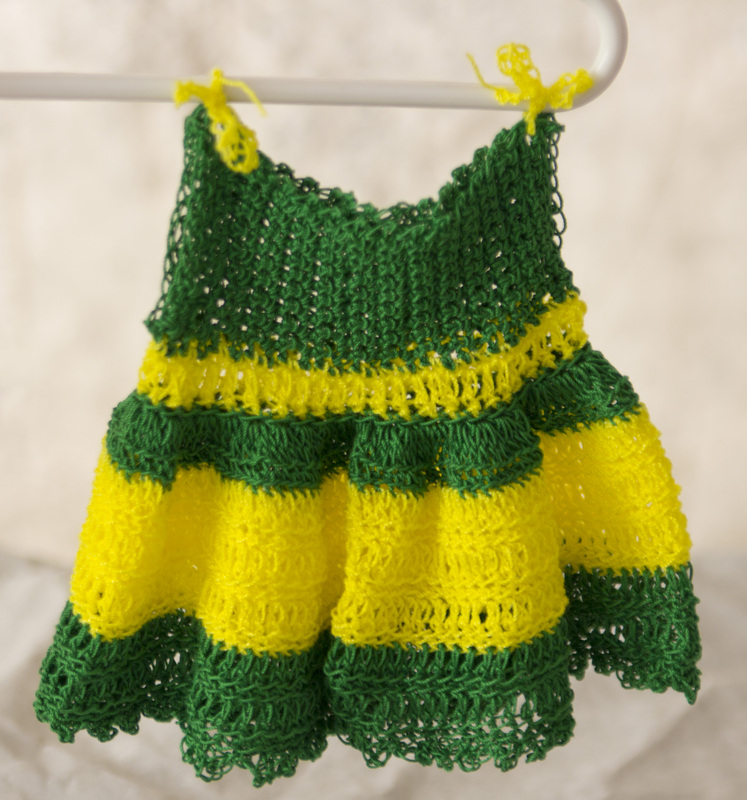 She wanted most of the dress in green with a little yellow. I didn’t bother telling her that I couldn’t find that same color yarn anywhere. So….she gets this!